Classic V13/M12 Shell covered in a natural hemp skin for a sleek sneaker style look. Beefy & durable 2 peice soulplates. Adjustable metal buckle with a quick release system. 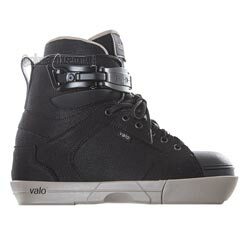 Sizing Chart below is specific to Valo V13/TV/AB/EB/SK's. Run about 1 - 1 1/2 sizes small. Due to narrow width.